The Freezer. What a great name, and how perfect that he earned it against the franchise that once housed the Fridge and plays for the team he trampled to earn the moniker. 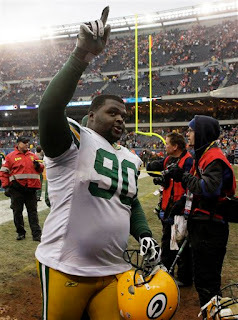 But while everyone is talking about BJ Raji's interception for a touchdown, let's not forget his involvement in the first score of the game. I mean, how beautiful was that Aaron Rodgers naked bootleg? It was brilliant. A play which was probably the best Mike McCarthy has ever drawn up, one which stamped an exclamation point on a debilitating opening drive and stated, "You can't stop us." There's some irony in that statement when you consider the Bears tried to do the same thing after winning the coin toss. They elected to defer, unwittingly setting the stage for the Packers to grab the game by the throat. To be fair, it was a bold move, and one McCarthy used this season against the Vikings with success. In their second game, the Packers gave the Vikings the ball first with the mentality that their defense could set the tone early, get the ball back with the score still even, and have the opening possession of the second half. This is what Lovie Smith had in mind when he made that call. But he couldn't have envisioned Aaron Rodgers making his defense look like practice dummies, going 4-4 with completions of 22, 26, 6, and 22 yards. He likely figured there would be at least one 3rd down the Packers would have to convert. And when BJ Raji came into the game on 2nd and 1, there's no way he saw the ensuing naked bootleg that put the Packers up 7-0. The beauty in the play wasn't just in the misdirection, either. It was the set up. This wasn't the first time the Packers showed this package in this situation. They lined up in the exact same formation against the Falcons and John Kuhn ran behind BJ Raji for a touchdown. The move turned heads--it was such a slap in the face of Atlanta. Green Bay basically told the world that they were going to run the ball and where they were going to go, and Atlanta still couldn't stop it. For a moment, Mike McCarthy was Mike Ditka, and Raji was William "Refrigerator" Perry. And you'd better believe the Bears were preparing for what has been dubbed the Elephant formation. They've had it coming for 25 years. When the Chicago Bears unleashed the Fridge on the Green Bay Packer defense in 1985, it left a lasting scar which is felt by fans who never even saw the play live. As a defensive tackle, there's no way the Packers could have prepared for him as a lead blocker, let alone a running back, and LB George Cumby was never the same player after his meetings with the Fridge. The embarrassment Perry caused the Packers and their fans lasted years, and stings each time the replays are shown. So when Raji came into the game, the Bears had to be thinking Mike McCarthy was out to exact revenge on behalf of Cumby and coach Forrest Gregg. Packers fans everywhere were hoping for it. Bears fans were dreading it. The Bears defense was prepared for it. At least they thought they were. I think what I liked most about the play was its defiance towards history. Although it would have provided some nice symmetry for sports writers such as myself to wax poetic over, had Raji gotten the ball it would've been a copy-cat play; coaching plagiarism committed by McCarthy. Instead McCarthy took the play and turned it on its head, creating a new memory which simultaneously overshadows the old one and stands alone. Mike catches a lot of flack for his play-calling, but he deserves credit here. There have been other hurdles cleared this season as well. This Super Bowl marks the beginning of a new era for the Green Bay Packers, one which finally leaves the legendary 1996 team behind. Much has been made this week about Aaron Rodgers building his own legacy, stepping out from behind the Favre shadow. Personally, I feel he's been free from said shadow all season, but that's beside the point. The way you escape such a shadow is not by walking an already trodden path, but by blazing your own. Aaron Rodgers has done that since he took his first snap as a starter in 2008, and the man who drafted him, Ted Thompson, is finally getting his due for doing the same. 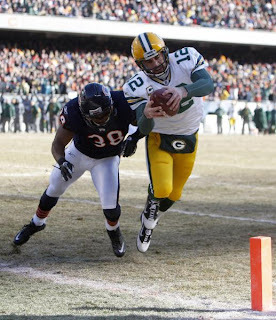 But amidst all of the larger-scale accomplishments, I'll remember Rodgers' bootleg very fondly. Not as him separating himself from Favre, but as the moment Mike McCarthy eclipsed the massive shadow of the Fridge with the Freezer. And he did it his way. I prefer the moniker "Meatlocker" for all the undigested red meat that is crammed in his bowels!! Veni, Vidi, Vici!! Hail to the Victors!